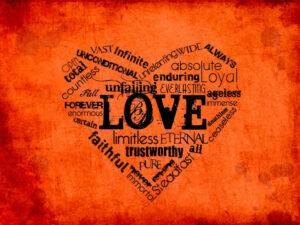 It is in surrendering to love, the love that is God, the love that is lasting that we can walk in love no matter what. I was reminded of that again this past week as I was leading a retreat and shared a story about my niece Cailey. When Cailey was about 5 or 6 I returned home to my parent’s home after being away she came bounding down the hallway and leapt into my arms in a big hug. When I say leapt, I mean like half way down the hallway she was in the air already and her arms and legs were ready to completely embrace me. It was from that moment on that I told her she gives the best hugs – because she does – but also because her hugged reminded me about God’s deep love for me (for us). It also speaks to me now about my own surrendering into God’s love. Am I willing to leap? Am I willing to trust that God will catch me and embrace my all? How is this in tune with my daily desire to be a vessel for God? Am I open enough to know that even in heartbreak that God’s love is within and among me? 1 Corinthians 12.31- 13.13 is for us an examination of living and loving. Do we strive for greater gifts? How do we speak of others? Ourselves? Do we do so with love? Do we gather up knowledge and wealth and relationships for our selfish pleasure? How do we love? How do we make love known? In this letter to the Corinthians the famous passage reads: “Love is patient; love is kind; love is not envious or boastful or rude… it is not irritable or resentful… it bears all things, believes all things, hopes all things, endures all things.” This is the power of love and more than one commentator, mystic and author has suggested that we should substitute our name in place of the word love. Now that is a true examination of living and loving. Am I patient? Am I kind? How do we reflect love? How do reflect Christ? How do we open ourselves up to God’s true love? What does faith look like in my life? How does love live within me and among me? Do I trust in love even in the heartaches? Can I allow God’s love into my brokenness? Can I surrender my all to love? Where and what is love in my life? What and who do I love? God of Love, enable us to love, we pray. Amen.